Goodreads Summary: When her best guy friend falls victim to a vicious hate crime, sixteen-year-old Cat sets out to discover who in her small town did it. Richly atmospheric, this daring mystery mines the secrets of a tightly knit Southern community and examines the strength of will it takes to go against everyone you know in the name of justice. Against a backdrop of poverty, clannishness, drugs, and intolerance, Myracle has crafted a harrowing coming-of-age tale couched in a deeply intelligent mystery. Smart, fearless, and compassionate, this is an unforgettable work from a beloved author. While the premise of Shine was interesting, I wasn’t sure of it at first, because I’m not the biggest fan of someone trying to discover why their (former) best friend died. But I liked Shine more than I was expecting, because the story is more than just Cat trying to figure out who attacked Patrick severely enough to put him in a coma. Shine really gets into this very small, closely knit town, I loved seeing what life was like in this small town, and what it was like for people living in this town. It definitely felt realistic, and sadly, Shine is a book that I can see happening- mostly because it does. There are so many different issues in Shine, and they are what takes center stage. Patrick’s attack is what puts everything in motion for Cat’s change over the course of the book. I wasn’t crazy about Cat’s secret. It is why she’s no longer friends with her friends, and why she keeps to herself. I certainly understand why she acted the way she did after it happened, but other than showing that we all have our secrets and that people can change, I’m not really sure why it was important to introduce it into the book. I think my favorite moment of Shine was when Beef (which is a nickname, in case you’re wondering) wanted to know why Cat cared about what happened to Patrick, even though she hasn’t been friends with him in years. Which is a good point, and I felt like we didn’t really get to see why she cared. She can care about why someone would hurt Patrick, and while it didn’t same fake or anything, I also wish we saw why she cared. Considering that there are so many other things going on, I felt like Cat’s investigation wasn’t a big part of the novel, even though we did see her poking around and asking people questions. Robert really grew on me by the end of the book, and I’m not sure how I feel about the rest of the characters. There certainly is a cast of characters, and there is certainly an assortment of them. They’re all pretty distinct, but for some reason, I’m feeling really neutral about most of them. They did come to life throughout the book, and really added to the overall character of a small Southern town. Speaking of the setting: for some reason, it didn’t feel like the book was set in North Carolina. I got more of a rural Tennessee or rural Kentucky, or maybe even a rural West Virginia vibe from the book. But considering my traveling adventures are limited (and limited to the West Coast), I could be totally off on this. I also liked that the mystery wasn’t obvious, and that you’re not completely sure what happened until you find it out. Looking back, there were parts of it that weren’t a big surprise, but overall, the mystery of Patrick’s attack was really well-done. I actually liked the narration, and something about Shine worked really well as an audio book. One part was hard to listen to, but other than that, I thought Elizabeth Evans did a great job narrating. 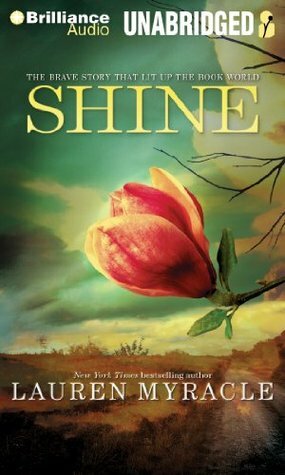 I really liked Shine, and was pleasantly surprised that the book was more about life in a small town, rather than a story of a girl who wants to know who hurt her childhood best friend. I didn’t completely love it, but it is a great story. Shine gets 4 stars.